In the wake of the shock felt by millions after 50 innocent worshippers were gunned down in New Zealand on March 15, the name that is on everyone’s lips is not that of the Australian gunman, but of New Zealand’s Prime Minister Jacinda Ardern. Ardern, who at 38 years old is the country’s youngest Prime Minister, has been praised around the world for the way she has held herself throughout the aftermath of the disaster – the deadliest mass shooting in New Zealand’s history. Immediately following the shootings, Ardern took to the world stage to announce that New Zealand would ban automatic weapons, and within a week her government delivered on that promise. During her speech she managed to carefully condemn the violence, while avoiding a slew of hate that certain leaders have turned to following such events. “This is not New Zealand,” she proclaimed, a phrase that has taken to the streets of the country in the last few weeks. Ardern made it clear in the aftermath of the tragedy that social media sites were much to blame for these massacres, and that the sites should take responsibility for managing their content. Following the attacks, the mother of one comforted the victims at Christchurch, donning a black headscarf and hugging grieving families. She visited schools and urged children not to tolerate racism. She has constantly referred to the tragedy as a “terrorist attack”, a term which for some reason is often not used to describe white attackers. She has referred to the victims, many originally from middle-eastern countries, as “us” and opened Parliament with the Islamic greeting “As-Salaam Alaikum”, a few days after the event. She has also promised to work on fast tracking visas for the families of victims and announced that the State would cover the cost of all 50 funerals. When Donald Trump called to ask what the US could do to support New Zealand, Ardern simply asked him and his country to provide “sympathy and love for all Muslim communities”, a task which the President, who is currently battling to deport international citizens and build a wall between the US and Mexico, will surely not respond to. Her biggest success in all of this was to present the population of her country as one, to make everyone feel affected by this tragedy, not just Muslim communities. From the second she spoke after the massacre she removed the idea of an ‘other’, and used her position to help victims, rather than use the story for any political gain. One big question arising from the swift work of the New Zealand government in banning assault weapons is how a country with a deep hunting background can change gun laws in 10 days, but a world power who faces mass shootings daily can’t manage to pass a single legislation to make the agony stop. Female leaders are criticized differently to their male counterparts, viewed as soft or lacking substance, judged more for their fashion choices than their words – something that irked Michelle Obama deeply during her time as First Lady. 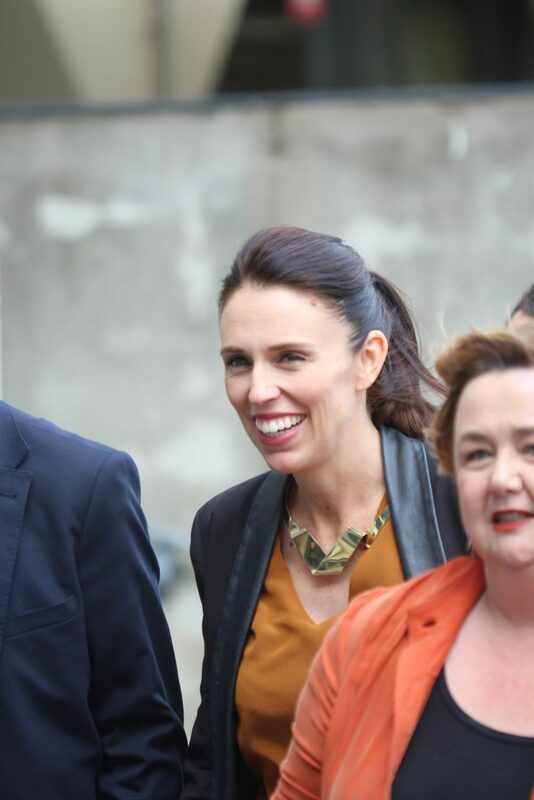 But Ardern – who has worn simple black clothing since the tragedy and was formerly known more internationally for bringing her baby into the UN than her leadership style – has become the face of a leader who can be viewed with nothing but respect. While President Trump is probably the most renowned leader for inappropriately reacting to disasters, even well-liked leaders such as Justin Trudeau, who failed to meet victims of a Quebec Mosque attack in 2017 in person, have publicly lacked the empathy and support that Ardern has shown. It doesn’t take the touch of a woman or a mother to provide compassion in a time of crisis. It just takes an understanding of what it means to be human. Ardern has managed to provide unity to a nation in shock, while also maintaining an integrity and inner-strength that any leader should aspire to. As the next generation of leaders, this is who we should be looking to. A leader who can change laws and unite the people a terrorist tried to fragment, while also being able to hug a grieving mother. In a time where social media rules, and many future leaders don red ‘Make America Great Again’ caps, this is what we should aspire to. This is what a leader should look like.